In early 2010, Yoox, an online retailer launched by Italian entrepreneur Federico Marchetti, shipped its first batch of handpicked Gucci shoes to the United States. While Yoox created buzz by selling end-of-season luxury goods to Europe’s bargain-hunters, Marchetti, a powerful fashion influencer, sought customers beyond his home continent. He created a fashion e-commerce giant with his “invisible” partner, United Parcel Service (UPS). Yoox (net worth two billion dollars) has benefited from UPS’s fast-paced inventory-and-logistics network as the international shipper banks on the potential of European small and medium-size enterprises (SMEs). 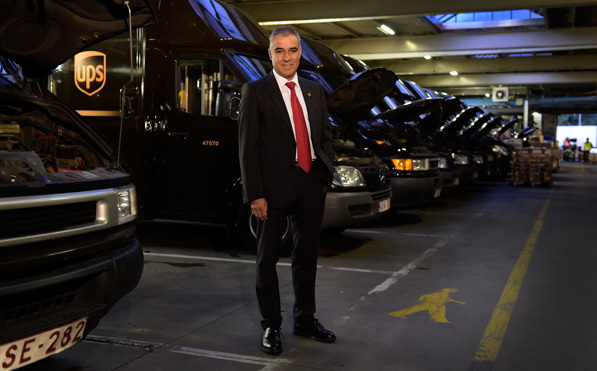 For Luis Arriaga, a 23-year UPS veteran and the president of its West Europe district, the Yoox success is not idiosyncratic. A logistic solution he and his team crafted for this once-unknown luxury seller can be applied with precision to millions of SMEs flanked by weak economic growth and slumping consumer spending in their home markets. “Small business has become the growth engine for Europe,” says Arriaga. The European Commission confirmed, finding in 2013 that 21.6 million SMEs employed 88.8 million people and generated €3.666 trillion in added value. In other words, SMEs in the European Union (EU) made up 99 out of every 100 businesses, created two out of every three new private-sector jobs, and contributed 58 cents of every euro of value added in 2013. UPS is set to clinch that niche market that has yet to become a battleground for commercial shipping. Although credited as the real backbone of Europe’s gross domestic product, burgeoning small business has been a highly fragmented market that includes all manner of enterprises, from Belgium’s high-tech sector to France’s wine makers. Arriaga, a Tecnológico de Monterrey-trained engineer, has a penchant for streamlining every process with a scientist’s precision. After joining UPS right out of college, he realized that many small companies might lack the crucial elements for competition in the overseas market: speed and cost-efficient supply chain. “Many customers make product without understanding who they are competing with in the overseas market,” Arriaga says. “Once they define their product, we come in with the solution. It is time and resources that matter.”Arriaga sees business opportunities in the mom-and-pop shops. “While medium-size businesses are more likely to export,” he says, “there are more micro businesses.” 19,745,690 more, to be exact. Micro businesses make up more than 92 percent of enterprises in the EU. They rival large businesses in employment (creating 29.1 percent of jobs versus 33.1 percent) and lead SMEs in value added. For years, Europe’s SMEs had been held back by lengthy exporting procedure, the fear of goods being damaged or lost, and limited knowledge of markets. UPS is helping them overcome those obstacles. Arriaga’s team designed boxes that protect fragile products. He also recently launched educational workshops and a tool kit, his latest effort to bring more SMEs into the exporting business. “We inspire [SMEs] to export to particular locations and educate business owners on destination countries for their goods,” he says. Arriaga approaches every exporting case with two considerations. He begins with supply chain management. A customer’s inventory must correspond to its consumer demand. Next, customers need to define the potential opportunity of serving a market and the potential cost of supply chain. Arriaga’s team examines the cost in every step of exporting and swiftly leverages UPS resources to minimize expenses incurred. In most cases, UPS plays a role beyond a logistic middleman. In the early stage of Yoox’s global expansion, UPS’s warehouse in New Jersey slashed inventory expenses for the retailer. For century-old Portuguese wine company Jose Maria da Fonseca, UPS solved transportation concerns by ramping-up support, from accelerated customs clearance to electronic invoicing, making it possible to ship last-minute orders in two days. Local manufacturers have fueled the growth of UPS in West Europe. The company has expanded its Cologne, Germany logistics hub, where hourly packaging capacity is now humming at 53 packages per second. Arriaga says he is aware of local competitors trying to offer similar services, but with UPS, SMEs get the connectivity of more than 12,500 access points in Europe. SMEs present an exciting opportunity for UPS, and research suggests their increased globalization holds great potential for the EU economy as a whole. The European Commission projects the value added to the union’s economy increases by 1.4 percent when total SME exports increase by 10 percent. Arriaga says UPS will continue to encourage businesses to export and educate them on how and where to ship, making itself an invaluable facilitator to Europe’s small-but-mighty SMEs.